Defines a fuzzy membership function through a Gaussian or normal distribution based around a user-specified midpoint (which is assigned a membership of 1) with a defined spread decreasing to zero. The tool that uses the FuzzyGaussian object: Fuzzy Membership. The Gaussian function is useful if the membership is near a specific value. 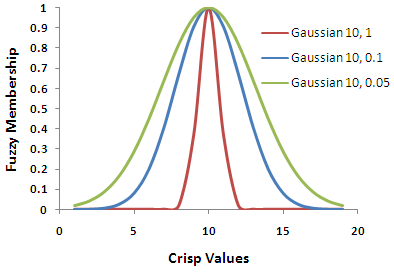 Gaussian is similar to the Near function but has a more narrow spread. Variations of the fuzzy Gaussian membership function. The user-defined value with a fuzzy membership of 1. Defines the spread of the Gaussian function. The spread generally ranges from 0.01 to 1, with the larger the value results in a steeper distribution around the midpoint. Demonstrates how to create a FuzzyGaussian class and use it in the FuzzyMembership tool within the Python window. Performs a FuzzyMembership using the FuzzyGaussian class.